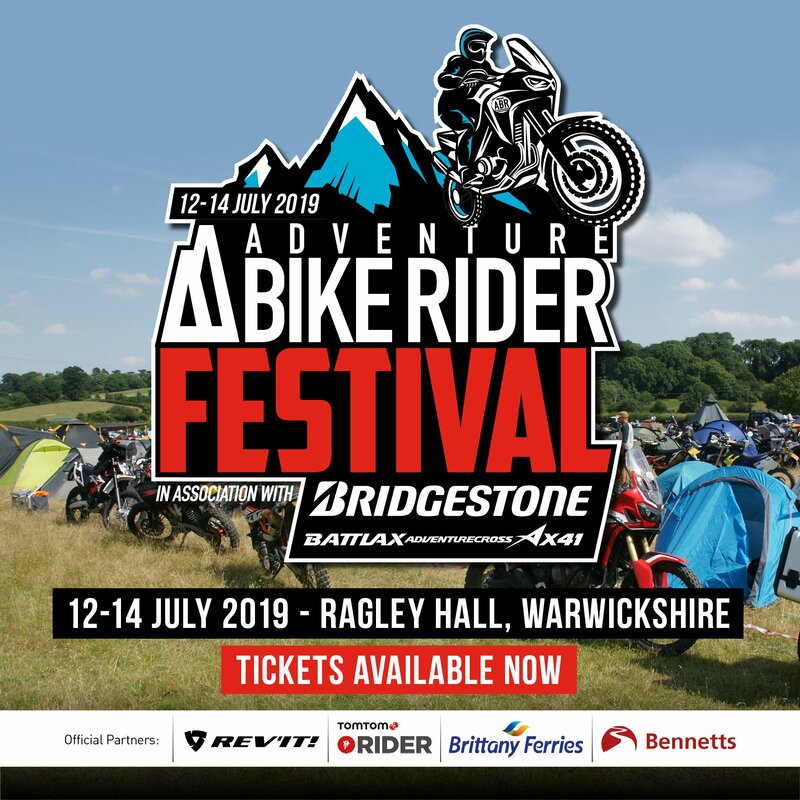 ABR Forum member Brenhden Seago loves a challenge, so he decided to have a crack at the Trans Euro Trail (TET) in England. Here’s his trip report. A quick blast from Somerset to Chepstow in the morning put me at the nearest point of the TET from my house. 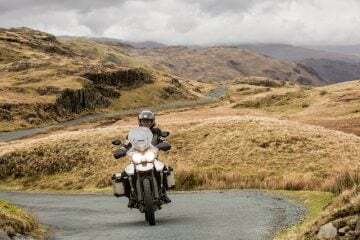 The B4235 is one of those roads that every biker will love. It’s all sweeping corners and ups and downs framed by forest on either side. 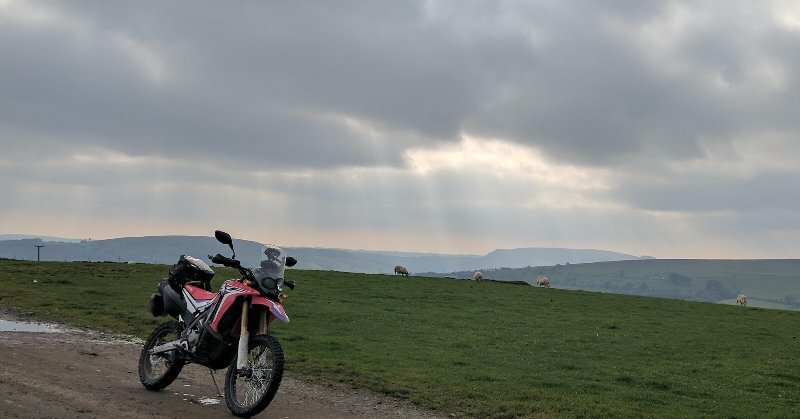 Alas, it was slightly wasted on me, as today was the first time I’d gone back to enduro wheels (from supermotos) on the DR650, and I was a bit unsure of the fresh Trailwing on the back. I had also just started using Viewranger on my phone for the first time and forgot it would constantly be going to sleep, in the way that proper Sat Navs just don’t. 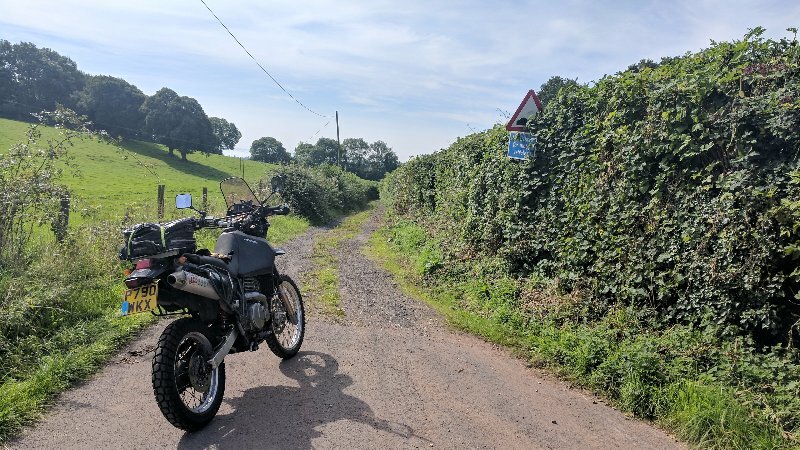 A left turn down to Shirenewton and on to Red House Lane had me humming the old Hendrix tune, and I was met with my first unpaved section. A lovely easy lane for a few hundred meters and then a right turn onto a trail between a copse and a field, and after about nine meters I stopped to make sure I was going the right way. It didn’t look like anyone has taken a bike down here in years! 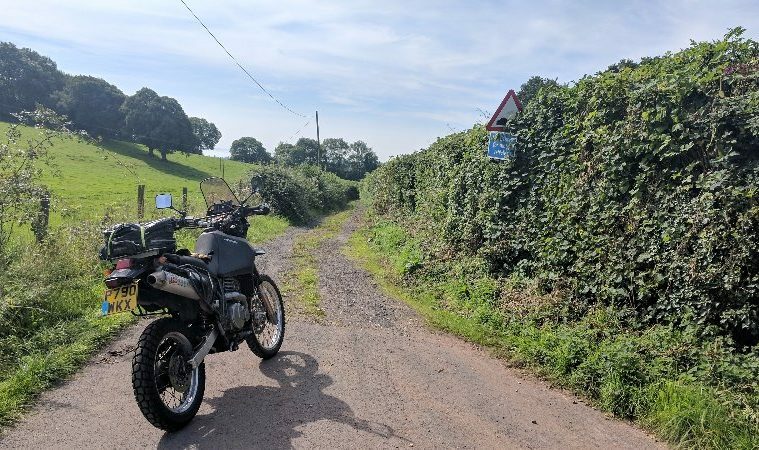 It was too overgrown to get up on the pegs without branches knocking you off and (most surprisingly for Wales) too hot to have the visor down. It took me about 25 minutes of sweating to pull it all aside enough to guide the bike under and by the time I was through I was covered in cuts from the holly. I was super chuffed to be through though, I might add some secateurs to my toolkit. Out the other end, along some forest roads and Pen-Y-Worlod Road, I came to a gate. The trail went through, so I opened it. 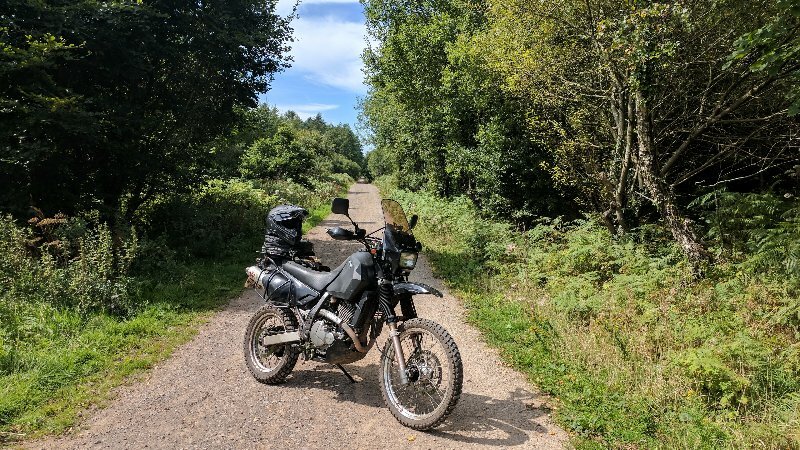 A farmer wandered down to me and we had a good chat about bikes and horses, but it was clear that there was no right of way on his paddock so I missed this bit out and carried on to Wentwood, which had a super pleasing and easy trail. This soon headed downhill and got narrower and narrower until it became a stream which I had to ride through for a few hundred yards. After a couple of big steps at the top, I was back on the road. More lovely country roads took me past Celtic Manor and into Caerleon which is a pretty place. Past Ponthir and onto the final trail of the day which I almost missed. This was another overgrown jobbie, although nowhere near as bad as the first, soon it became too enclosed to support any life! Photos can never really capture how steep the descent is. 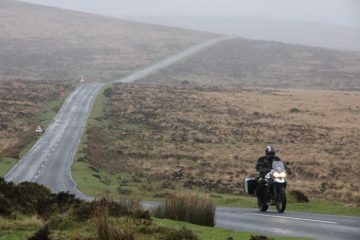 If you lost it here in the wet, you and your bike would slide a really long way. At the bottom, it was roads to Cwmbran and then I decided to finish on a high and head back home in time for a BBQ. 1. When I got back home, I checked for an update and there was a new version that is quite different from the one I did. Getting the most up to date version is really important. 2. A phone is no substitute for a Sat Nav, so a new Montana is in order. 3. 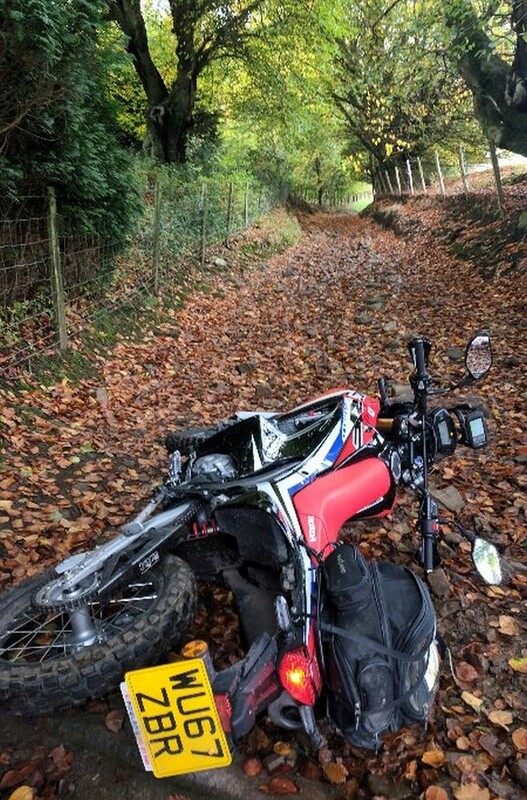 I wouldn’t like to do those trails on anything bigger than say a Tenere although I’m sure some people could manage. 4. 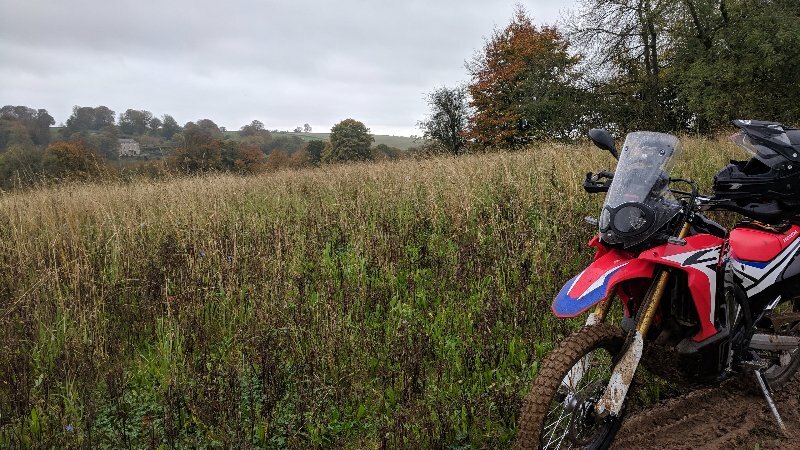 My new Trailwing rear tyre was really good in the mud, but if we hadn’t had a dry spell I would have probably got stuck. So, I might be looking at a ratchet winch. Having learned from my previous outing, this time I came a bit more prepared. 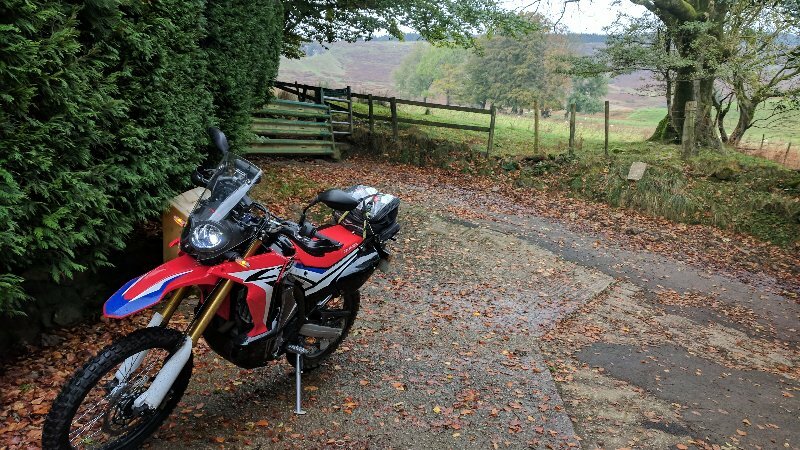 I’d bought myself a CRF250 Rally and Garmin Montana (treat yo self) and had spent the day before fitting some old wrap around hand guards. After another blast up from Somerset to Cwmbran, to where I had set off last time, I was pleased to see how easy it was to use the GPS. I’m not drinking this month, so I was feeling particularly chipper as I wound up Henllys Lane. 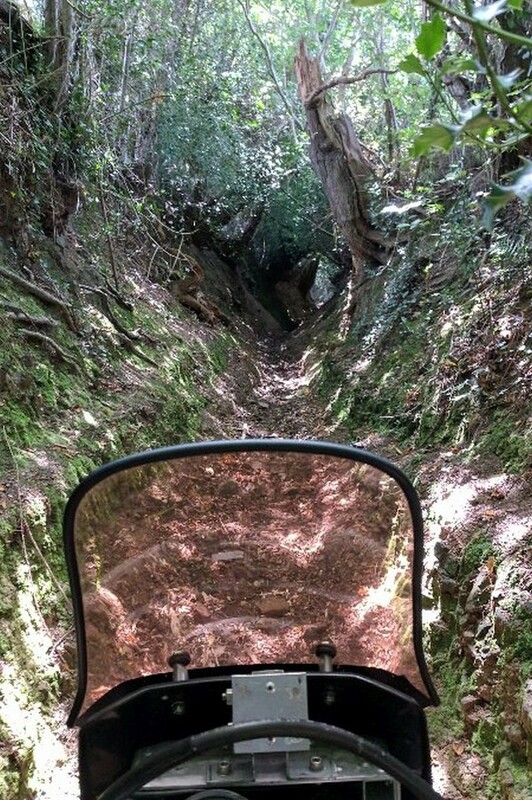 It’s so steep and so greasy with wet leaves that the back wheel was slipping out on the way to the trail! At the top of the lane, I pulled up at a gate and immediately had a problem. The front wheel didn’t have enough traction to hold the bike on the brake. It took me about 10 delicate minutes to get the bike to a place where I could get off without it pulling me back down the hill in a heap. You can see how steep the hill is by the angle of the gate. The gate was a big heavy thing, with a thick chain on the back that acted as a self-closing mechanism. It was so strong that it took another 10 minutes of hard graft to get the 30kg kerbstone (that you can see in the picture stood up) to hold it open. Once I was through, I had a new battle on my hands. It was just as steep but now, instead of leaves and tarmac, it was leaves and loose cobbles. 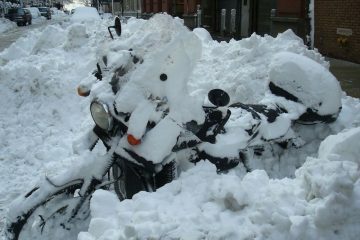 I parked the bike (while sweating) and shut the gate. 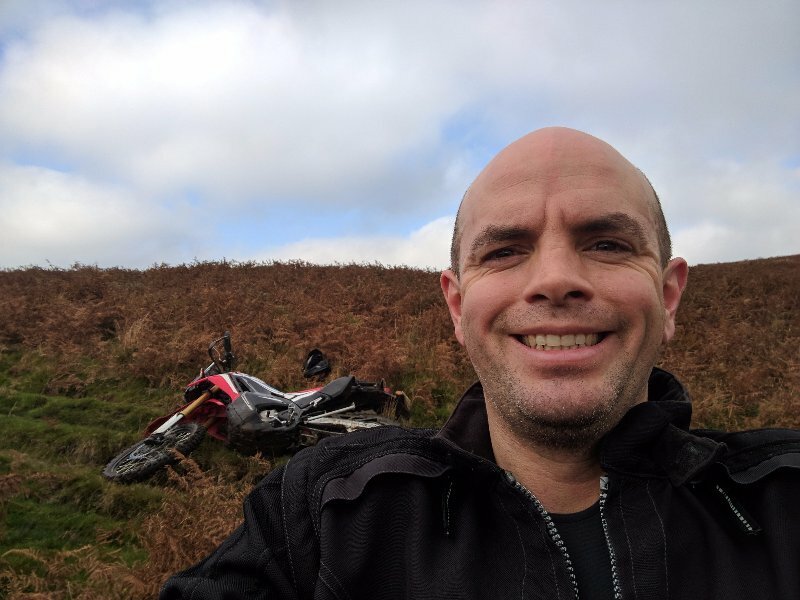 I hopped back on the bike and immediately dropped it – not the start to its off-roading life I was hoping for. 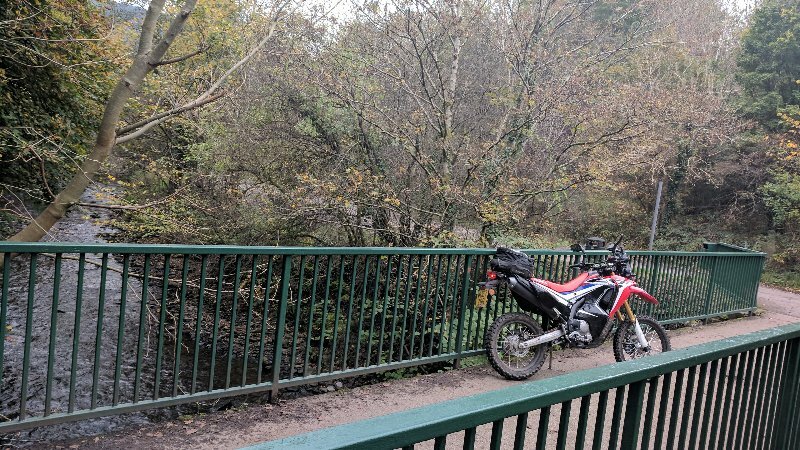 I hoisted it back up and moved around two metres and dropped it again, this time bending the handguard onto the brake lever and locking it on. Cursing the god of cobbles, I got my tool kit out and bent it back into shape using a kerb (and some more swearing). 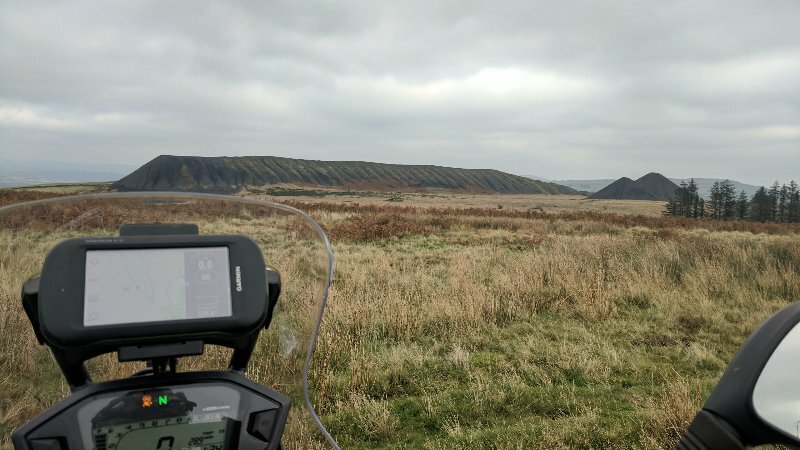 Once I was finished, I fired the bike up and walked it to a slightly flatter area to stand any chance of pulling off without another lay down. It had taken over an hour to move about six metres. 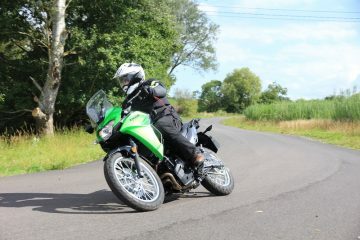 In the saddle, the bike is great off-road and getting up the hills on rocky tracks was awesome. The cobbles stopped and it became a lovely bumpy trail the came out onto a moor. There were a few routes to choose from and the GPX seemed to lead me into a bog, so I took a slightly higher road on Cwncarn Forest Drive and crested the top of the hill on a very soft trail. It was lovely to make a bit of progress, so I didn’t stop for a photo of the super view. Back down and this time, there was another thankfully easier gate and I transferred across to continue on CFD. However, the next gate was locked and blocked with boulders, so I popped onto the road and headed down into Risca. While I was on the road, I found out why bikes have ABS fitted – thanks to someone hammering up the hill in a Skoda as I was coming down. It probably saved me either hitting the car or sliding underneath it. 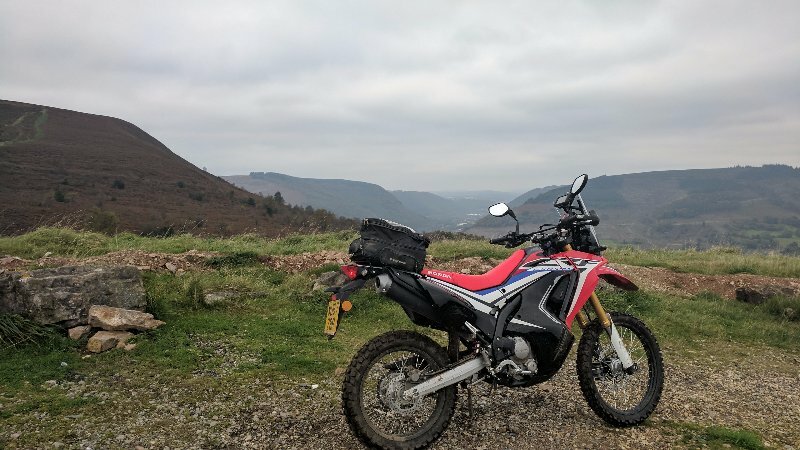 Anyway, after popping down to Tesco for tea and chocolate (and a long chat with the Gavin the trolley man about Hondas and local routes), I was out and up into Machen Mountain. It’s a lovely, old broken road with a cracking view which, unfortunately, is slightly ruined by tonnes of fly-tipped waste and the leftovers from kids partying. I continued down to the other side and crossed a lovely stream into Cwmfelinfache, which then took me out onto a long road section to Caerphilly and then up onto a lovely moorland. At this point, it started getting wet. There was a weird black mountain that just looked like a pile of coal and then bigger and bigger puddles with secondary tracks that were also bogged down. This area gets a lot of muddy traffic. As I went on, more and more of the track was under water, but the view was lovely (apart from all the fly tipping). Finally, I ran out of talent and got spat off the bike in the soft ground. Nothing was broken, but I was pretty sore the next day. Regardless, I hopped back on and it actually started to get easier around Senghenydd. The trail riding finished well with a ‘round the hill’ trail before going to Pontypridd. Filthy and happy, the Honda and I headed home. 1. Good handguards are money well spent. 3. 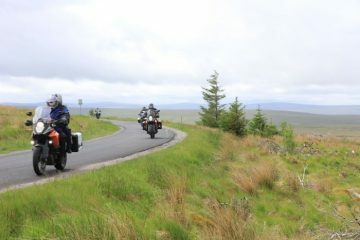 The side stand on the Rally is too tall, you have to really think about where to stop. 4. 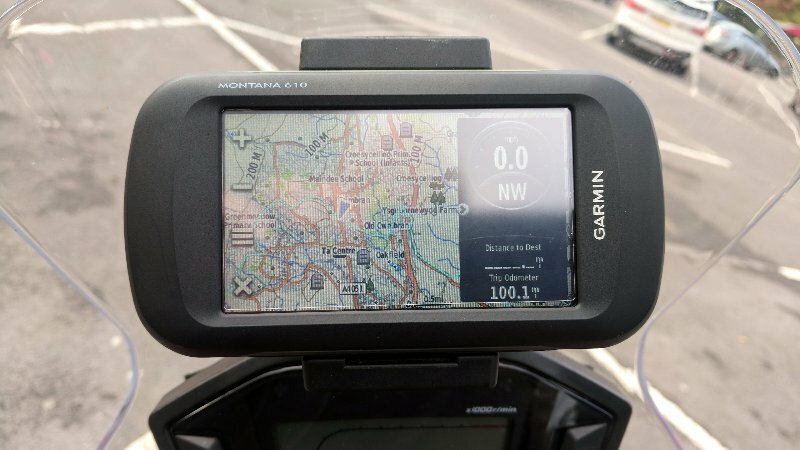 A Garmin Montana is well worth the money. 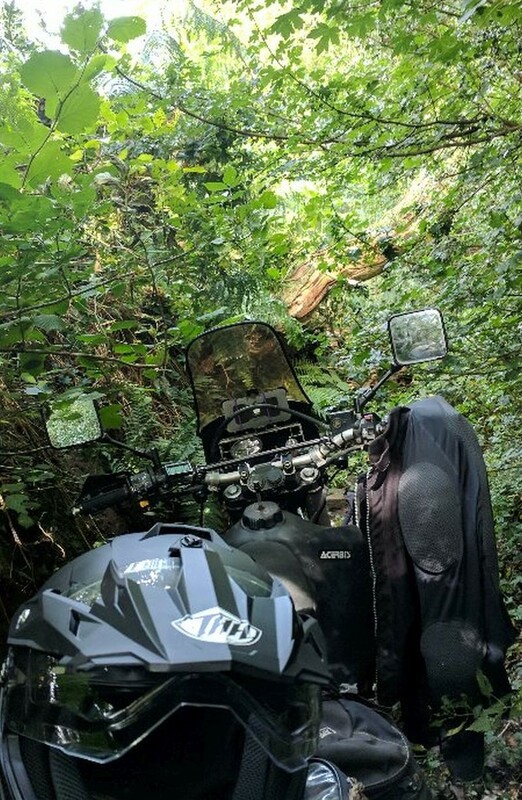 Day three was a really different day, I decided to stay a bit more local, pick some easier trails and was lucky enough to have a friend along with me too. So it was an early start and up to Gloucester to meet Rob. Rocked up to Churchdown skate park which is a great meeting place as it has a WC and Rob rocked up a few minutes later. 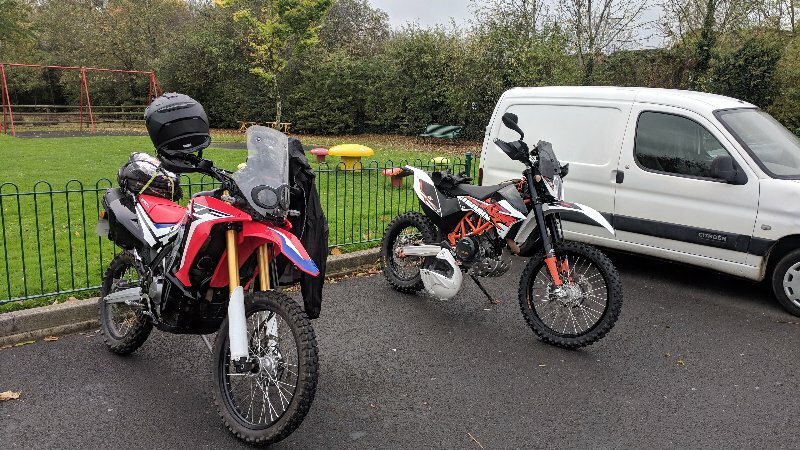 After a quick comparison of his 690 Enduro and my Rally, we were off. Two minutes later a closed road took us on a lengthy detour to get to our first trail, but it was worth it and so different to Wales. 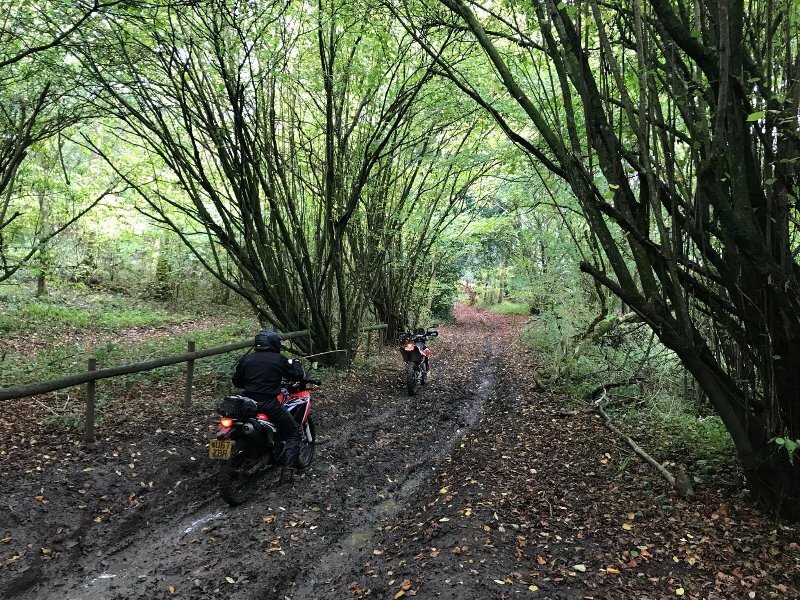 Almost all the trails we rode were long narrow and rutted by bikes, the local TRF are some seriously lucky people as there are so many trails in the Cotswolds. The first time one opened out we stopped for a quick photo. 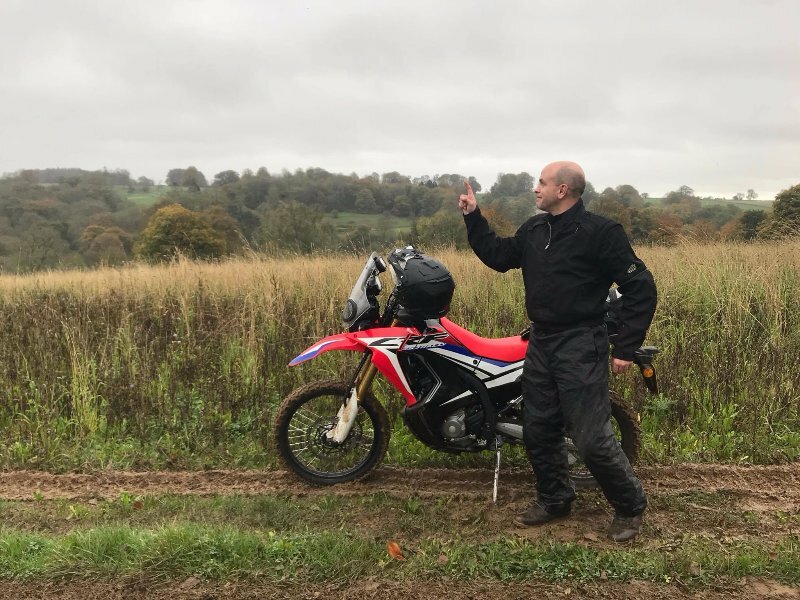 In the mud and the leaves, my Rally was squirming around all over the shop, whereas the 690 Enduro, with its fancy suspension and maxxis enduro tyres, was having a much easier time of it. 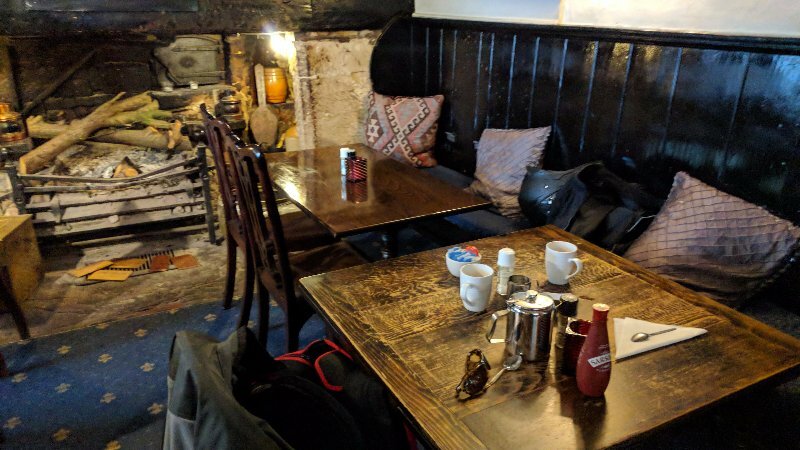 Our stomachs were rumbling, we pulled into Bisley and went into the Bear Inn. What a fantastic place, we were a bit soggy from the constant drizzle, so tea, scampi and chips were ordered and all was right in the world. 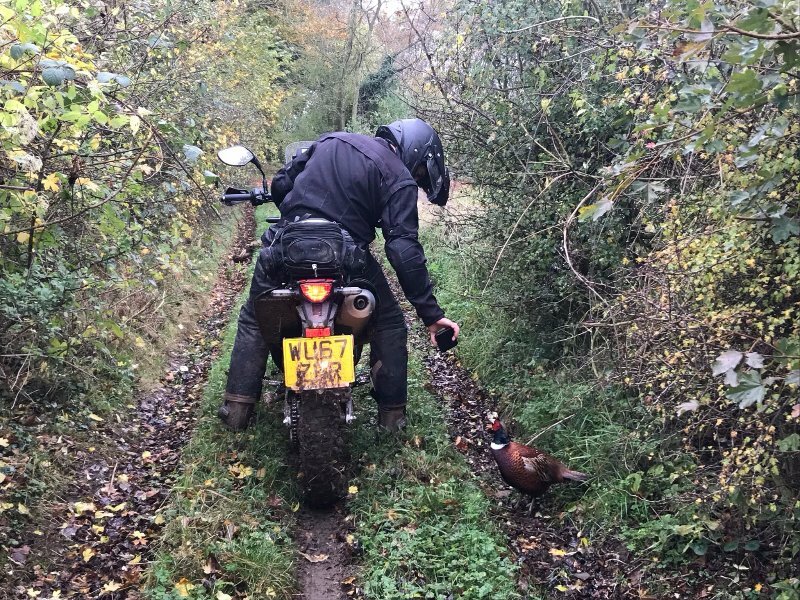 Two more hours of trail riding which included miles of rutted tracks and an extremely grumpy one-eyed terrier took us almost to Tetbury, and we decided to call it a day. 1. Gloucestershire is full of lanes. 2. I need to let some air out of my tyres to help with grip. 3. When you clean a Rally after a day in the mud you need to get your hand inside the engine fairing – there were heaps of mud and leaves in there! 4. 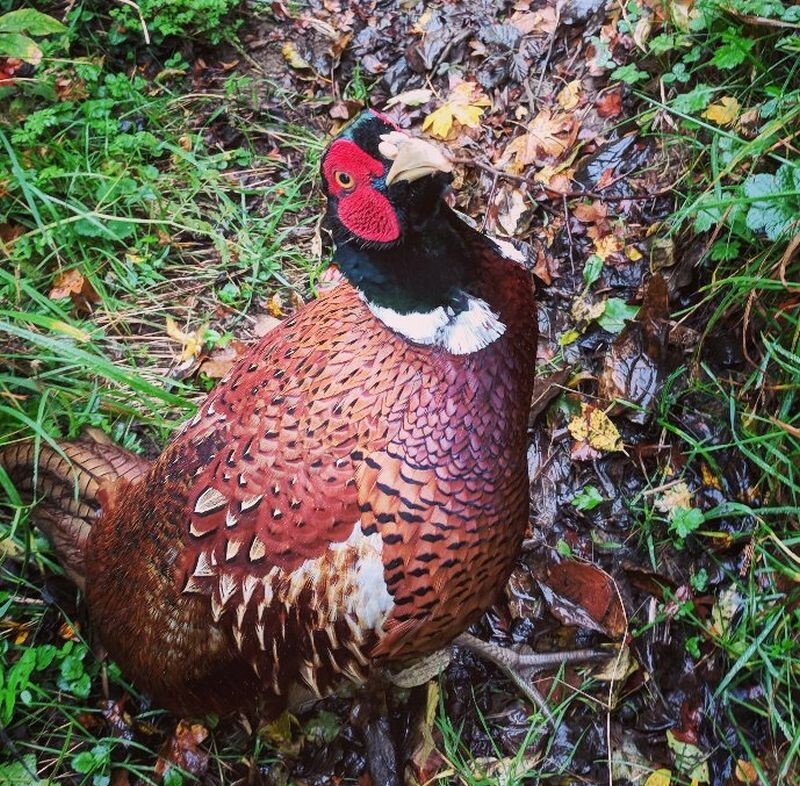 Don’t mess with Barry the Pheasant! 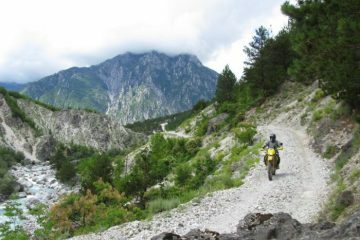 Be sure to check out the trip report of the French sections of the Trans Euro Trail.